For decades, children have enjoyed reading about Eloise and her mischievous adventures living in New York City’s posh Plaza Hotel. The famous Eloise book series is turning 60 this year. To celebrate, The Plaza is hosting an array of family-friendly activities commemorating all things Eloise at The Plaza Hotel. 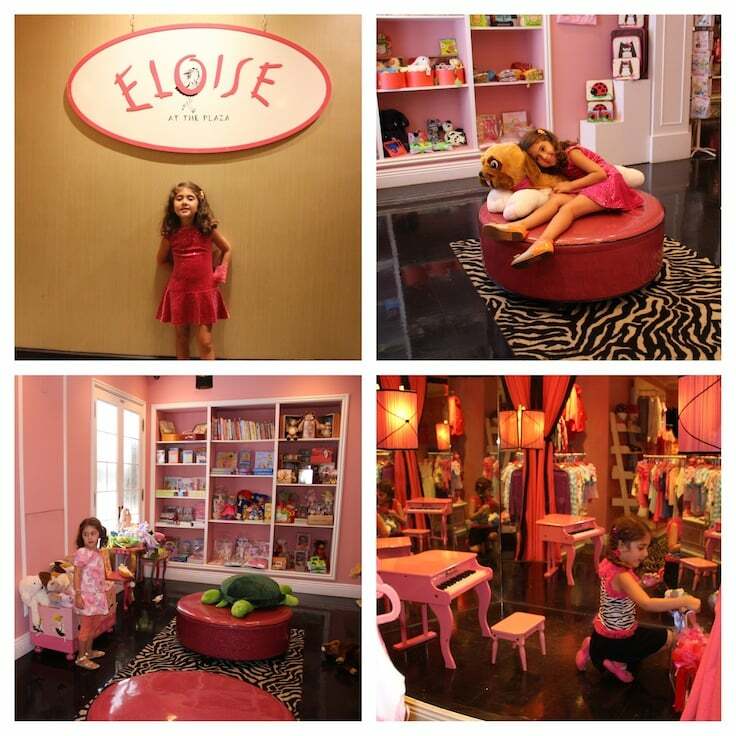 One of my young daughter’s favorite places to visit in all of New York is the Eloise at the Plaza Shop. Here kids can watch Eloise movies, hold a mini piano recital and shop, shop, shop! You’ll find exclusive memorabilia from the Eloise books, a wide selection of toys, games, plush animals, jewelry and hair accessories plus clothing galore in the fashion room (complete with a zebra runway!). 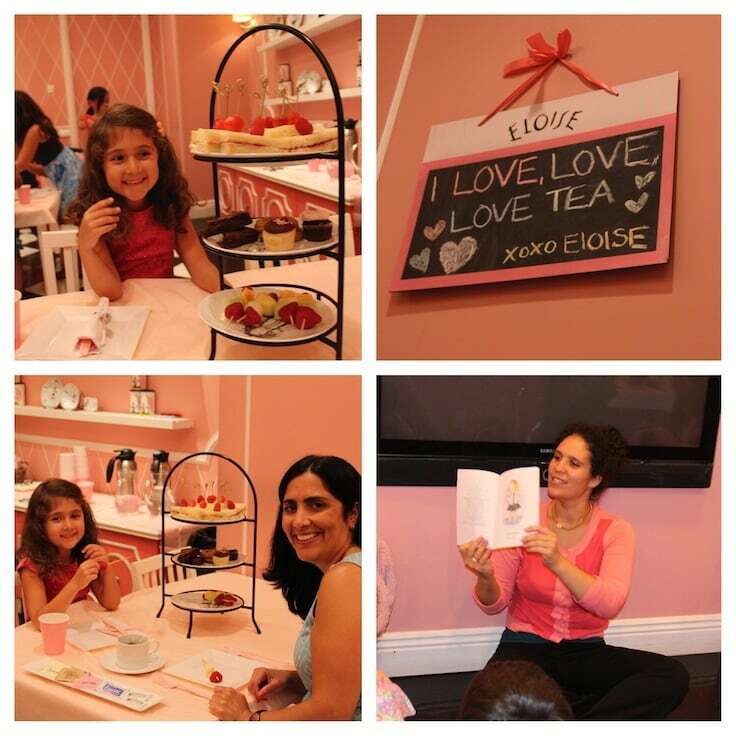 In addition to the Friday tea parties (below), the Eloise Shop hosts a variety of dance parties, cooking classes, and other fun events as well as private birthday parties. For young children, the Rawther Fancy Friday Tea at the Eloise Shop is an adorable introduction to afternoon tea. 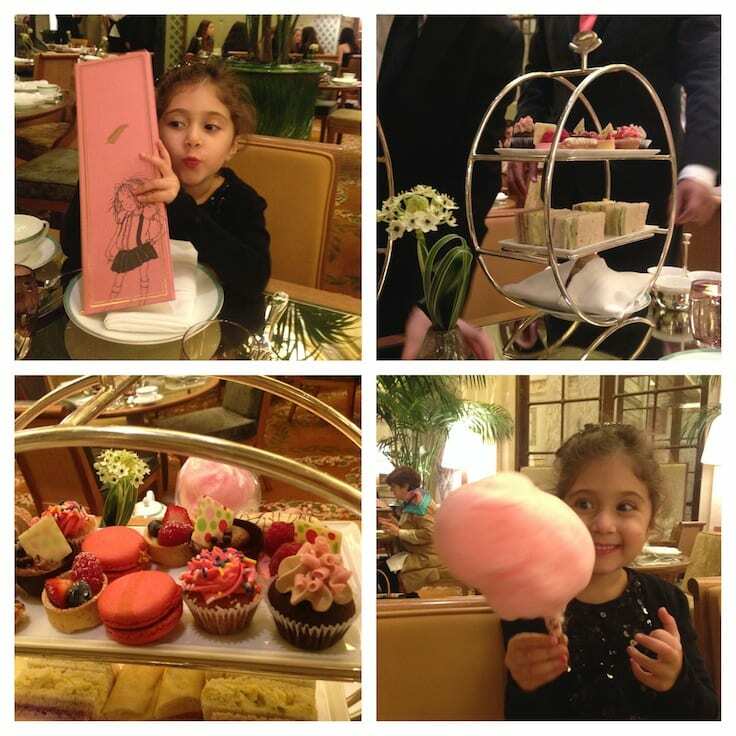 Kids and adults are served tea, pink lemonade and a delicious assortment of tea sandwiches, desserts and fruit kebobs. Children answer trivia questions, write letters to Eloise and enjoy story time before departing with a keepsake book and other goodies. Held on Fridays and during holidays, this is a great option for a special mother-daughter date. Be sure to book in advance as it fills up. Going for “grown-up” tea at The Plaza’s Palm Court Restaurant is a fantastic treat for a big occasion or birthday. I took my daughter for her fifth birthday and she still raves about the cotton candy, fancy tea cups and all of the delicious pastries. To commemorate the book’s anniversary, guests can also order a special Eloise birthday cake this year. Tea at The Plaza’s Palm Court is more formal than the Rawther Fancy Friday Tea. I recommend bringing well-behaved guests ages 5 and older. For the ultimate sleepover splurge, book a stay in the Betsey Johnson designed Eloise Suite featuring très chic black and pink decor. The Eloise Suite Experience package includes accommodations in the Eloise Suite, Eloise’s Afternoon Tea for two, an Eloise robe, a copy of the Eloise at The Plaza book, an Eloise puzzle and canvas tote. Bring the whole family and book the adjoining “Nanny Suite” which comes with champagne and truffles. Charge it, please!!! Eloise knows how much fun it is to have Central Park as her backyard and now your kiddies can follow along on their next visit with Eloise’s Central Park Scavenger Hunt map. Visiting these iconic kid-friendly attractions is a great way to explore New York City’s famed Central Park. 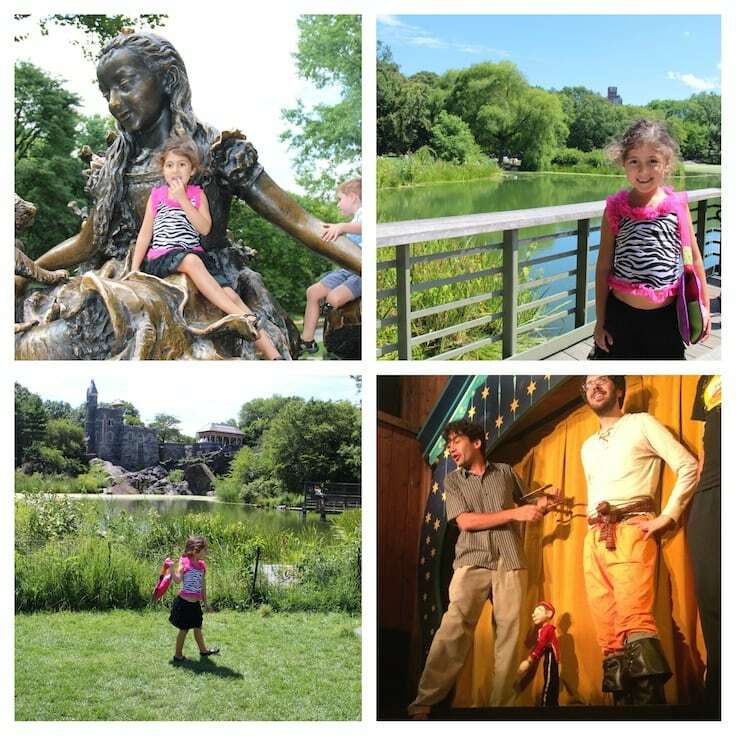 Highlights include the Delacorte Music Clock by the zoo, the Alice in Wonderland statue, the Swedish Cottage Marionette theater (a most mahvelous spot! ), and Turtle Pond – where the amazing views make you forget you’re in a big city. Eloise likes to stay in touch with all of her fans. Kids can write postcards to Eloise and leave them in her special pink mailbox outside the Eloise at the Plaza Shop and she will respond (via email) in pink, pink, pink. For more immediate gratification, pick up the pink telephone around the corner from the Palm Court and you can hear a personal message from Eloise. Even if you can’t live at The Plaza like Eloise, you can still get in on the fun! 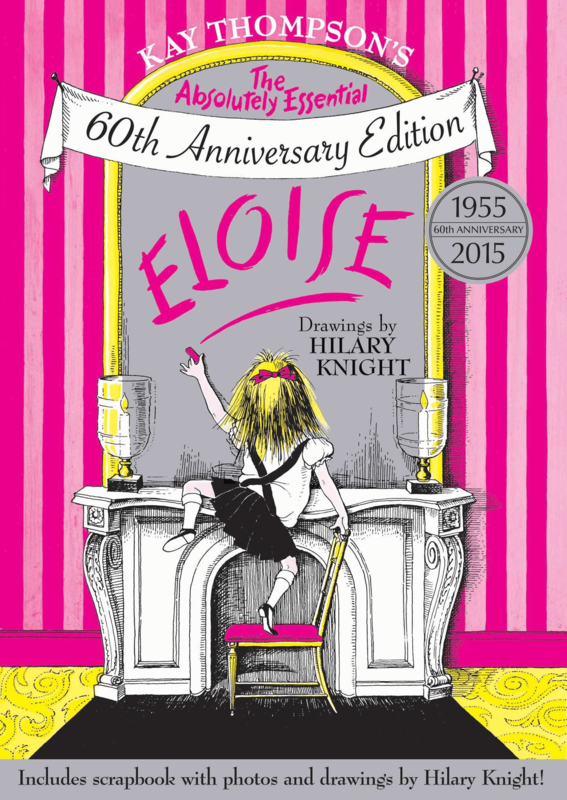 Get your copy of Absolutely Essential Eloise 60th Anniversary Edition or the Eloise at The Plaza. Then, read reviews of The Plaza on TripAdvisor and book your stay! Does your family have a favorite Eloise book? Let us know in the comments below! A Note from the Globetrotting Travel Mama: Special thanks to Eloise at The Plaza for hosting us at the Rawther Fancy Friday Tea. All opinions are my own, as always. Katja, you and your daughter should definitely check out the Eloise books. Her antics are entertaining for kids and adults too. And plenty of pink, pink, pink! Ahh, the adult tea is my favorite too! A fun outing for any season. I have never heard of Eloise but I am sure my daughter would love it! The Eloise books are great fun. I’m sure you and your daughter will love them. IF I had the pleasure of having a daughter, I would absolutely take her here. I love Eloise!